A sore neck last night cost Portsmouth's England goalkeeper David James his record of playing every minute of every Premier League game this season. It just leaves Bolton's Jussi Jaaskelainen, Everton's Tim Howard and Fulham's Mark Schwarzer remaining in that 100 per cent keeper club. Defenders Sylvain Distin (Portsmouth) and Michael Turner (Hull) are the only outfield players with that distinction. Jussi JaaskelainenThe 34-year-old Finland stopper is the longest-serving player at Bolton with more than 400 appearances under his belt since arriving from VPS Vaasa for just £100,000 in 1997. With four draws from the last four games, Jaaskelainen is enjoying his best spell of the current campaign, conceding just two goals, and will be rewarded with a testimonial against SPL side Hibs this summer. Tim Howard The American entered the Toffees' history books by shutting out Tottenham earlier this month. A 0-0 draw was Howard's 16th clean sheet of the season in the Premier League - beating the record set by Neville Southall in 1995/96. Howard is still five behind Gordon West's total from 1969-70 but there were 42 games in a season in those days. The 29-year-old has been Everton's star man on the road as only Manchester United, Liverpool and Chelsea have let in fewer goals away from home. Mark Schwarzer Fifteen clean sheets in the Premier League and with the best goals-against record outside the top three, Aussie Schwarzer has more than played his part in Fulham's charge towards a Europa League place. The Cottagers are on the brink of qualifying for Europe for just the second time in their history on the back of their highest-ever points total in the top flight. Gentle giant Schwarzer has not picked up a booking all season. Sylvain DistinDistin is reported to have turned down Liverpool and Newcastle when leaving Manchester City in 2007. 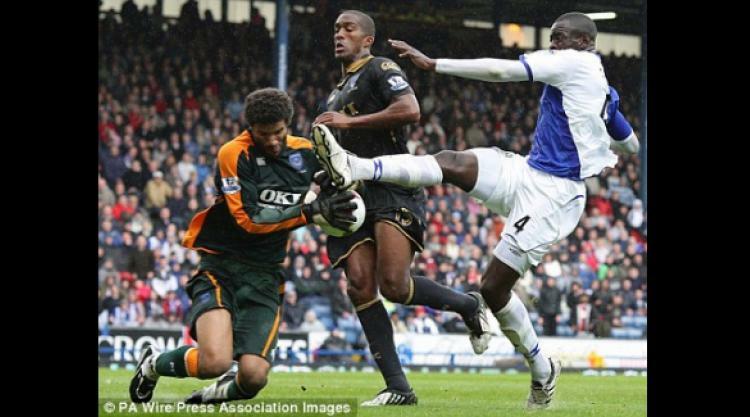 The French defender wanted regular first-team football and he has certainly managed that at Fratton Park. The 31-year-old has formed an impressive partnership with Sol Campbell in the Pompey rearguard. Michael Turner Turner has been touted for an England call-up after a string of outstanding displays in the Tigers' debut season in the top flight. The 25-year-old is a right-sided centre-half but always a threat at set-pieces, Turner has weighed in with five goals in all competitions. Turner was instrumental in Hull's blistering start to the season but faces a nervy final day against Manchester United after slipping towards the trapdoor.